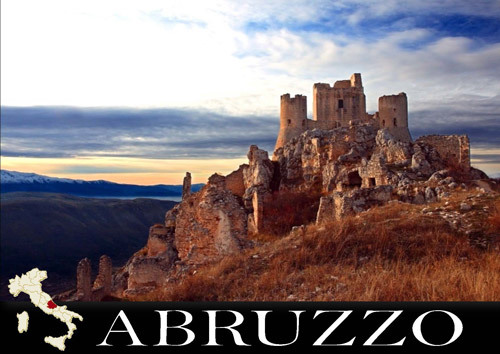 Abruzzo, is a region in Italy, its western border lying less than 50 miles (80 km) due east of Rome. The region not only holds a cultural and civil record for protection of the environment, but also stands as the biggest nature area in Europe: the real green heart of the Mediterranean. 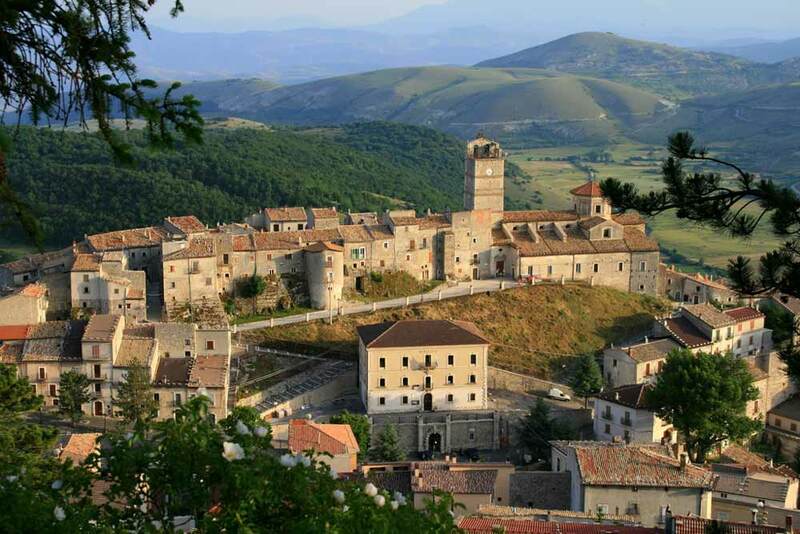 With a third of its territory set aside as Park, Abruzzo was indeed nominated Europe’s greenest region. Abruzzo borders the region of Marche to the north, Lazio to the west and south-west, Molise to the south-east, and the Adriatic Sea to the east. 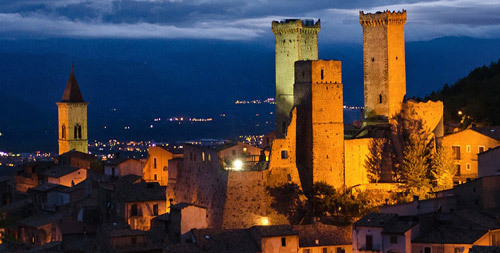 Although it is geographically more of a central than southern region, ISTAT (the Italian statistical authority) considers it part of Southern Italy, a vestige of Abruzzo’s historic association with the Kingdom of the Two Sicilies. 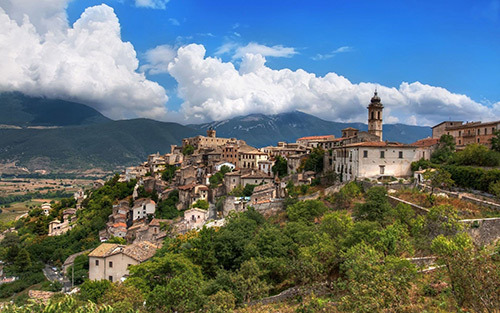 Abruzzo is located in central Italy, stretching from the heart of the Apennines to the Adriatic Sea, on a mainly mountainous and wild land. The mountainous inland is occupied by a vast plateau, whose highest peaks are the Gran Sasso (2,912 m) and Mount Majella (2,793 m). 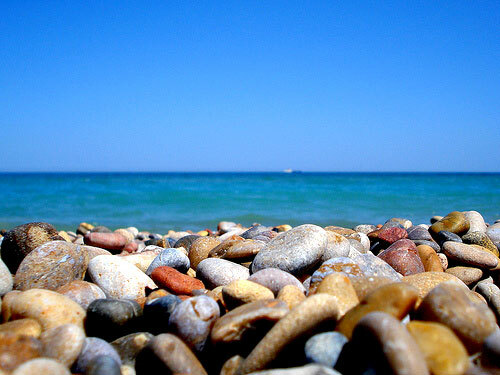 The Adriatic coastliine is characterized by long and sandy beaches to the north and pebbly beaches to the south. 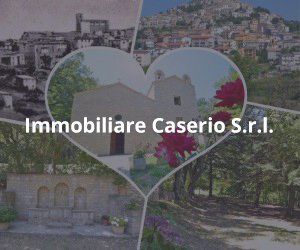 In this wonderful landscape many villages were included in “I borghi più belli d’Italia” association for their historical interest and architect armony of the urban fabric. 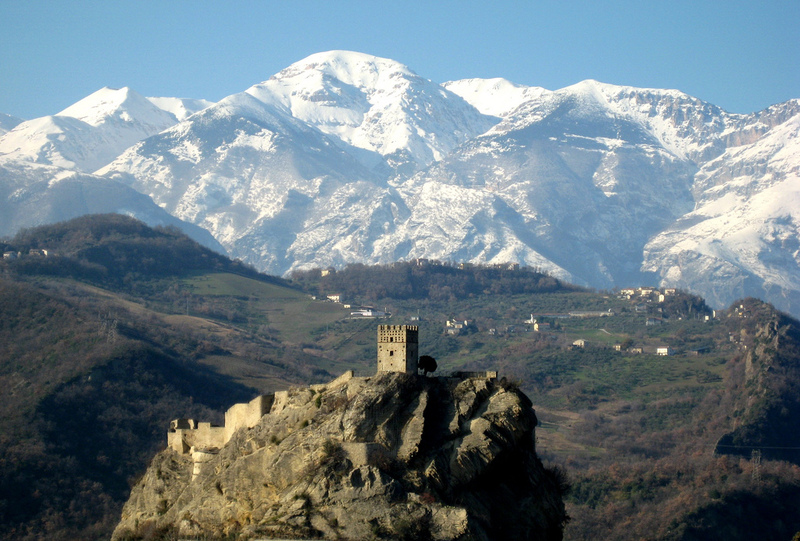 The Abruzzo region has two types of climate; the climate is strongly influenced by the presence of Abruzzo’s Apennine Mountain range-Central, which divides the climate of the coastal and sub-Apennine hills of the interior mountain ranges of the highest: while coastal areas have a Mediterranean climate with hot and dry summers and mild winters and rainy hills presents the climatic characteristics of type sublittoral with temperatures decrease progressively with increasing altitude and precipitation with altitude instead. Precipitation also strongly affected by the presence of the Apennine mountain ridges of the region increases with the proportion being more abundant in the field and on the slopes exposed to the west, instead of decreasing towards the east and east-facing slopes. Often the Adriatic coast are sidelined rainfall from the west to the barrier effect of the Apennines undergoing the action of gentle winds descending from it (or Libeccio Garbino). The minimum annual rainfall, however, are found in some inland valleys, sheltered from much disturbance to the blocking action of mountain ridges, such as the Valley Peligna, or the valley of the river Tirino, which in some places (Ofena, Capistrano) showed barely 500 mm, and not along the coast where it never falls below 600 mm, for if the Teramo is relatively little watered by rain (Teramo less than 800 mm), the meter is exceeded in Chieti, reaching maximum levels in the Adriatic, while between Ortona and Vasto in Costa Trabocchi decrease again. The highest rainfall is found instead in upland places on the border with Lazio, are especially vulnerable to disturbances Atlantic, and are around 1500-2000 mm (Pescara in 2010 showed a value close to 2800 mm). 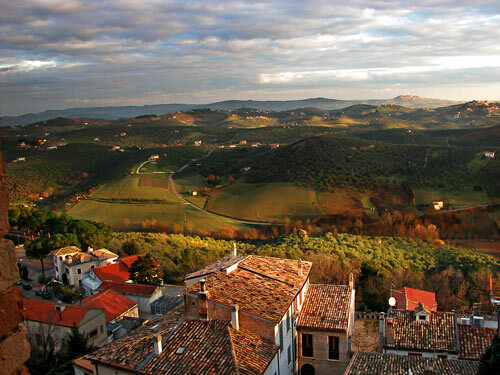 As with many Mediterranean regions, Abruzzo’s vegetation is characterized by the presence of different Mediterranean ecosystems; the coast and the surrounding areas are remarkable for the presence of typical Mediterranean plants such as myrtle, heather and mastic, but in hilly areas other typical Mediterranean species will also grow, including olive, pine, willow, oak, poplar, alder, arbutus, broom, acacia, capers, rosemary, hawthorn, licorice and almond trees, interspersed with oak trees. Between 600 and 1,000 meters of altitude spans submontane vegetation, mainly characterized by mixed forests of Cerro, Oak, Oak, Maple and Hornbeam; very common among the shrubs are, specifically, Rosa Canina and Red Juniper. Between 1000 and 1900 meters of altitude, there appears a great deal of beech tress. has spread a lot of the beech. Higher still in the Apennines, above 2000 meters of altitude, we find the presence of the orchid species like alpine, mountain juniper, cranberry black and finally a unique species, perhaps as Edelweiss Abruzzo. To learn more, see the entries Abruzzo Chamois, Brown Bear and Marsicano Shepherd Maremma-Abruzzese. The fauna of Abruzzo are highly varied, and the animal symbol of the region is undoubtedly the Abruzzo Chamois that has had a remarkable recovery after risking extinction. 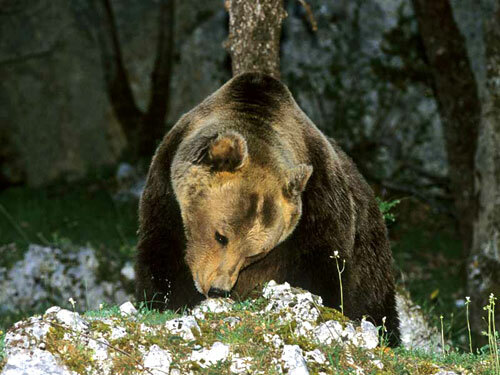 Another animal typical of this region is the Marsicano Brown Bear, along with wolves, deer, lynx, roe deer, snow vole, fox, porcupine, wild cat, wild boar, badger, otters and vipers. 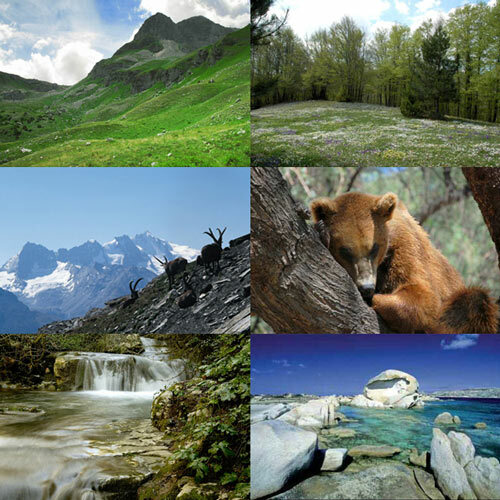 The natural parks of the region include the Abruzzo National Park, the National Park of Gran Sasso and Monti della Laga the National Park Maiella and Sirente Velino which every year attract thousands of visitors due to their nature and rare species of wildlife such as Abruzzo chamois; also the region boasts many natural reserves and areas protect. 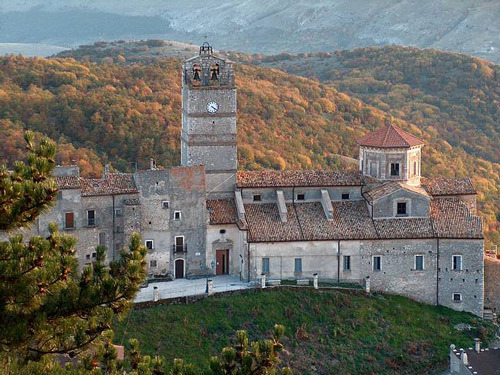 Both the agricultural and coastal aspects of Abruzzo have contributed to its cuisine. One of the most prominent dishes of the region is maccheroni alla chitarra. This dish is created by pressing or cutting pasta through an instrument called a chitarra, creating long thin noodles similar to spaghetti. The pasta is served with a tomato-based sauce, often flavored with peppers, pork, goose, or lamb. This dish is served with complementary regional side dishes, such as the bean and noodle soup known as sagne e fagioli. This soup is traditionally flavored with tomatoes, garlic, oil, and peperoncini. • Pastuccia, a polenta stew with sausage, eggs, and cheese. • Agnello cacio e oro, a lamb-based fricassee. 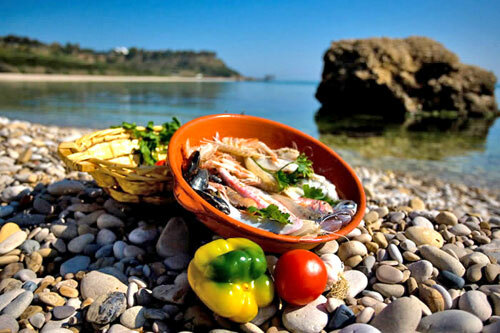 Seafood also plays a role in the cuisine of Abruzzo, especially in those areas located closer to the coast. 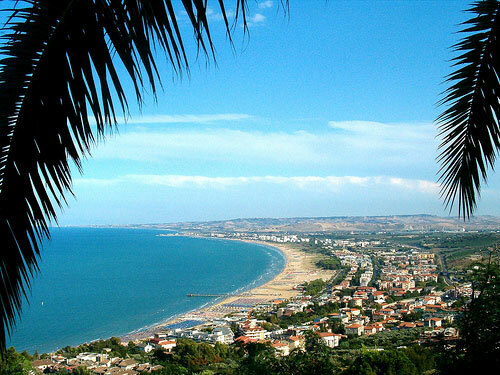 The variety of fish available to the area has resulted in several fish-based Brodetti (broths), coming from such places as Termoli, Vasto, Giulianova, and Pescara. These broths are often created by cooking the fish in an earthenware pot, and flavored with tomatoes, herbs, and peperoncino. • A rustic tart pastry filled with everything imaginable: eggs, fresh cheeses, ricotta, vegetables, and all sorts of flavorings and spices. Also from Teramano are the spreadable sausages flavored with nutmeg, liver sausages tasting of garlic and spices. The ventricina originally from Molise but also produced in the Vasto area, is made with large pieces of fat and lean pork, pressed and seasoned with powdered sweet peppers and fennel and all encased in the dehydrated stomach of the pig itself. Atri and Rivisondoli are famous for cheeses. Mozzarella, either fresh or seasoned, made from ewe’s milk, although a great number of lesser known varieties of these cheeses can be found all over Abruzzo and Molise. • Croccante, a type of nougat made from almonds and caramelized sugar, often flavoured with lemon. • Abruzzo International Airport is the only international airport in the region. Open to civilian traffic since 1996, has seen over the years more and more increase the number of transit passengers thanks to the airlines and low-cost flights. 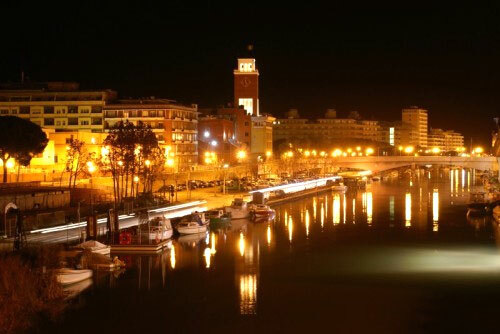 Today, the airport has a catchment area of over 500,000 passengers annually and connects the city of Pescara and the entire region with many Italian and European destinations. 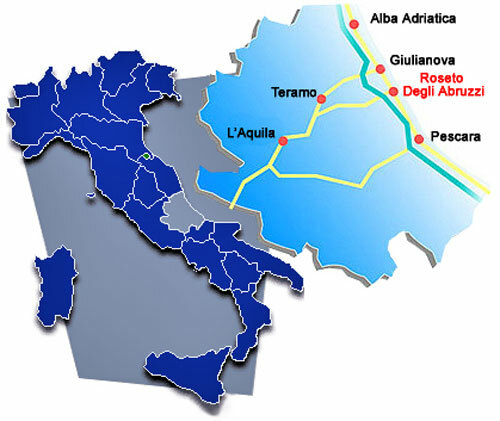 • L’Aquila-Preturo Airport is located in the nearby village of Courts and was recently renovated and modernized to accommodate flights presidential G8, specifically moved into the city after the earthquake in the Abruzzi. Soon the airport will also be open to civilian traffic.